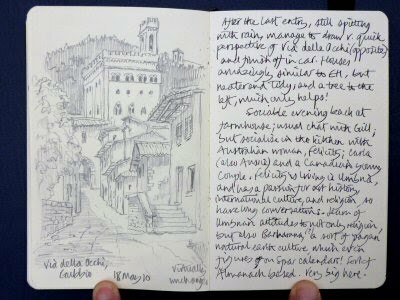 …After the last entry, still spitting with rain, manage to draw very quick perspective of the Via delle Occhi (in sketchbook) and finish off in the car. Houses and all very similar to plate in EH, but neater and tidier, and a tree to the left, which helps the composition! Sociable evening in farmhouse; usual mobile chat with Gill, then have conversations with Australian woman (Felicity), Carla (also Aussie) and a young Canadian couple. F is living in Umbria and has a passion for art history, religious studies and international culture, so learn much of Umbrian attitudes to life, and also ‘Barbarana’ a sort of Almanack based semi-pagan earth culture, which even figures on Spar calendars, it’s so mainstream. Obviously very big here F reckons it’s more important than religion to many.